So, I was lucky enough (well, cheeky, in that I took the liberty of e-mailing/pestering) the guys behind the phenomenal-looking labour of love that is the RE4HD Project. Many gamers were stung when SourceNext/Ubisoft released the abomination that was Resident Evil 4 on PC in 2007. The modding community didn’t take this shoddy port laying down though, oh no. One such member, Albert, made the game look 100% more awesome looking by exporting the original Gamecube game’s textures, then painstakingly modding them into the oh-so inferior PC version. Fast forward a few years, Capcom handled the “HD” version, which was a drastic improvement. This version actually contained real time cut-scenes, 60FPS option and many other enhancements. It was an awesome version, save for the lack of “true HD” textures… this is where Cris and Albert’s story began. We catch up with them to get the skinny on Capcom’s groundbreaking action/survival shooter and how they plan on making it visually awesome. RQ: How was RE4HD born? Did you just think “i’m sure this should have better quality assets for a HD remaster” and then start the ball rolling? [Albert] On my side, the project actually began back in 2007 when the first PC port was released. By that time, my goal was to use the Gamecube textures as much as possible (the old PC port used PS2 textures, which were lower resolution), and then I just upgraded the textures that looked too blurry using replacements that were sometimes not faithful to the original. Of course, the quality standards for that project weren’t as high as the ones for our current project… During the 2008-2014 period I did research about the sources of many of the game’s textures. And thankfully, in 2014 the new port using Gamecube / Wii assets was released! Gamecube hi-polygonal models, real time lighting and cutscenes, and all the original effects finally on the PC… but with terribly blurry textures! I came to the conclusion something must be done about that. [Cris] The idea was there for years, but I didn’t actually start until I saw the first screenshots of the UHD version and realized it wouldn’t be a real visual upgrade. 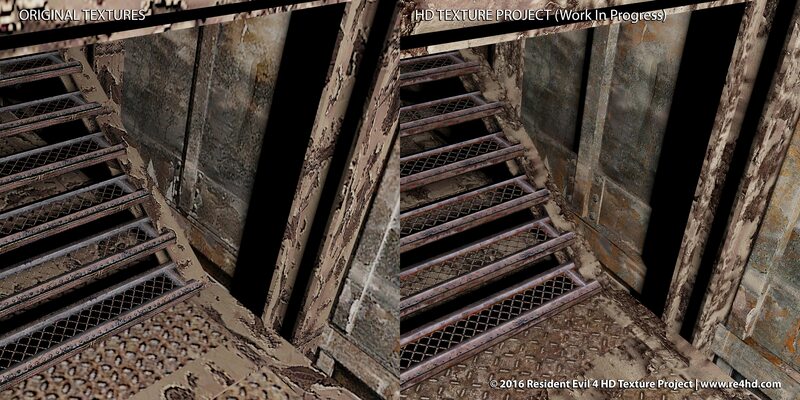 After a few weeks of working alone using the Dolphin emulator and the Wii version of the game, I saw some of Albert’s work online and was blown away by how he was finding the original real life texture sources. A few conversations later we decided to work together (thankfully!). 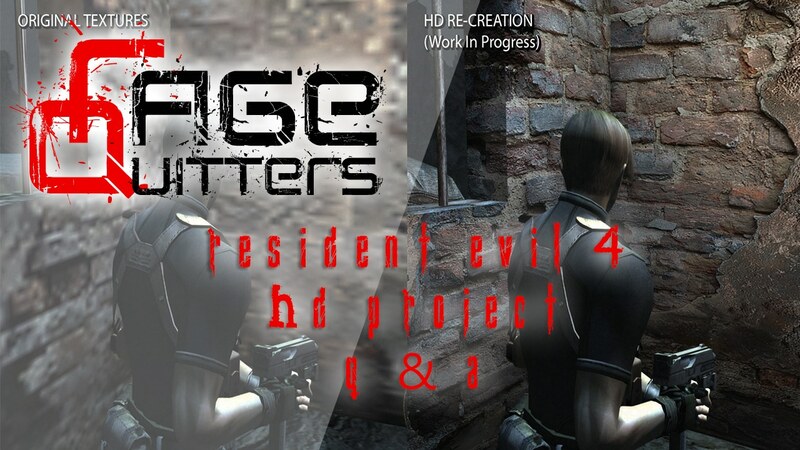 RQ: Have you worked on any other, similar projects other than RE4? [Cris] Only small things here and there for my friends to enjoy. Nothing on the scale of this project. Personally I think it’s a once in a lifetime effort and something I look forward to sharing with my kids when they’re old enough to play through the game. [Albert] Nothing related to videogames. Audio remastering for some Catalan dubbed anime series. I’m used to starting and finishing big projects… but not as big as this one! RQ: So, according to the RE4HD website, you’ve been working on this project 2+ years now. I remember your announcement threads in the REModding and NeoGAF forums and was blown away by the quality of your work. Do you ever get burned out or are you managing the project in a way that minimises fatigue? [Albert] I get burned out almost everyday after a few hours of work, but I magically get renewed energy day after day. I’m unable of taking anything easy. This is the way I am… haha. I’m just constant and I love what I do. That’s my secret! [Cris] It took a little bit of time to get into a rhythm and routine that would be sustainable long term. At first I was working on it 40+ hours a week, but eventually I realized (or rather… my wife helped me realize :)) that I would burn out if I kept going at that pace. So now it’s settled into a relatively predictable routine that takes up about 15-25 hours a week. And since I enjoy the work, it’s now at the point where burn out isn’t a concern. RQ: With the collaboration, are there any creative differences or do you generally both have the same vision for RE4HD? [Cris] I think we aligned rather quickly (within less than a month, I believe). If I remember correctly, the only “difference” that we had to work out was that I tended to apply too little contrast and sharpness, while I think Albert sometimes applied too much. So as an exercise, we took a single texture that we had both worked on individually (a rusted panel), compared our work, and refined it until we felt it was just right. Since then I think we both have had the same general “feel” for what’s right. [Albert] As Cris said, we both share similar work quality visions. RQ: How did the collaboration come about? I’ve used Albert’s texture packs in the past, he’s done some superb work. [Albert] To be honest, I’m quite embarrassed of the old work I did in the past when I compare it to what we are doing now! And I’m afraid that some people find the old texture patch now and think our current project will be something like that… No way! When I saw Cris’ texture work I was very impressed with the level of detail he was putting into that. I realized we could do something really good by joining forces. [Cris] The truth is that Albert’s been working on this years before I even thought about it. 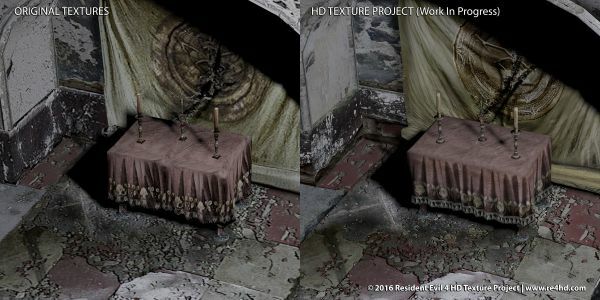 And so when I started sharing my efforts on the Resident Evil Modding community site, I came across some of Albert’s work and was really impressed, especially because I had no idea how someone could find these original sources. At that point I realized I needed to try to join up with his efforts. RQ: Are you sick of RE4 yet? Surely there’s only so many times you can play the same areas, be it testing or recording demo footage. To me, RE4 is a classic and I often find myself playing the game over and over. [Cris] Never! To this day I enjoy playing through almost every room and scenario in the game. And I still get creeped out by the sound of Regenerators breathing. [Albert] No! I enjoy killing all the enemies and grabbing all items every time I do some testing for the project! I can’t wait to finish it and finally do a complete play-through again like the old times. RQ: What do you do to relax when you take a break from the project (please don’t say you play RE4, lol)? [Albert] Haha no no, same as Cris, friends and family help me to keep my sanity to an almost normal levels. Some sport, movies, TV series, cooking, etc. fill the gaps between textures and textures haha. RQ: I know Capcom is supportive of the RE4HD project. Any word on whether it will be adopted as an official add-on for the game? [Cris] No word on any sort of official adoption at this point. But I hope something like that is possible. [Albert] I have a faint hope of Capcom future plans for a proper remaster of RE4. Who knows. RQ: How did you react to Capcom’s announcement to remaster RE2? It sounds like a lot of work as much of the game is being re-done, from scratch. [Albert] I always loved everything related to RE2. It’s my favourite RE game (mostly because of the story) and I’m open minded to revisiting it in a complete new form. I can’t wait! 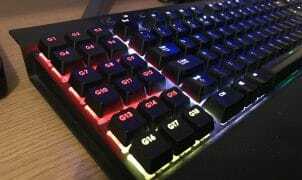 [Cris] I’m looking forward to playing it! Especially because it seems like it will be a complete remake with a control scheme like RE4. In all honesty, even though I finished RE1 and played through a decent amount of RE2, I could never get over the feeling that I was fighting to get the controls to do what I wanted them to. And so taking RE2 and remaking it with RE4’s camera perspective and general control scheme sounds great to me! RQ: What is your favourite Resident Evil game and why? [Cris] Would it be a big surprise if I said RE4? The control scheme still feels great and there are things that the game does very well even by today’s standards. The pace of the game is excellent, as is the variety of set-pieces presented to the player. The use of quicktime events doesn’t get overused as it seems to with many modern games. And the game continues to be a great example of letting the player feel gradually more powerful and in control as they advance in the game while also increasing the complexity of the challenges. It’s a fine balance and I think RE4 nails it. [Albert] As I said, RE2 is my favourite. The story, characters, music, ambiance… Lots of other games (RE4 for example) are more enjoyable in terms of playability, that is true, but RE2 is the one I have better memories of and the one that made me shudder the most when I played it the first time. Massive thanks to Cris and Albert for taking time out to answer our questions. For those of you not in the know, the RE4HD website can be found here. The guys have also very generously supplied us with a sneak peak of their latest work. Dripping with superb details. Cannot wait to get my hands on this! They are doing far greater job than Capcom. Capcom should learn from them. I hope Capcom integrates this into UHD and PS4 versions and pays them the good money they deserve. Probably not, just like hundreds of thousands other fan texture pack that never was released on consoles. Did you hear about shadow of mordor hd content it’s official Worner Bros/Monolith texture pack that never become avaiable on PS4. And this team not only make new higher resolution texture but also add new 3D models where before object was painted on texture. No chance that capcom will change their port and add some fan made texture pack. That stuff only on PC, even officialy. And actually you can pay this guys for the job they make, there is “donate” button on re4hd page. 3 Pings/Trackbacks for "Exclusive Q&A with The Resident Evil 4 HD Project Team"